Cats love to scratch any surface they can dig their claws into, whether it’s a scratch post or your table legs. Obviously, the latter isn’t ideal if you don’t want your furniture decorated with scratch marks, but it’s important not to tell your moggy off for this unintentional attempt at interior design. Scratching is a natural behaviour for cats as it helps them to keep their claws in good condition and mark the area as their territory. Glands between their paw pads leave behind a unique scent that, combined with the visual scratch marks, helps send a message to other cats that this area belongs to them. It’s not much different from us trimming our nails and putting locks on our doors. 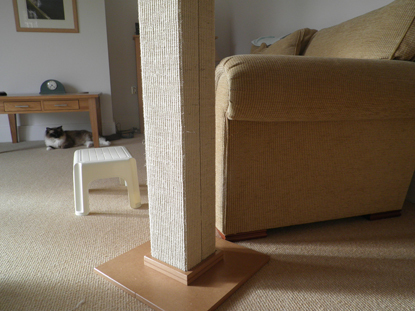 To discourage your cat from leaving their mark on your soft furnishings, you need to encourage them to scratch something more suitable instead, such as a scratch post. 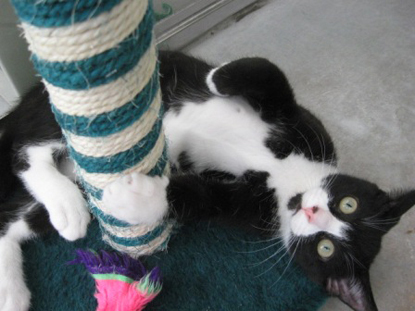 Height – Cats like to combine scratching with a bit of kitty yoga as it’s a great way for them to stretch their muscles. To help them get the most satisfying stretch possible, the post needs to be tall enough for them to be able to fully stretch up on their hind legs and still touch the top of the post with their front paws. Weight – If they’re going to be leaning their full weight against it for a stretch, the post will need to be sturdy enough to support them without toppling over. Look for one with a wide, heavy base that is appropriate for your cat’s age (eg a kitten scratch post won’t hold up against an adult cat’s weight). Type – Some cats, particularly mature moggies and those who are ill, can find it difficult to lift their paws up onto a scratch post, so they may prefer to use a scratching mat instead. Thread – Cats usually like to do to big vertical scratches but this can be difficult on scratch posts with horizontal thread, so vertical thread is preferred. Remember that if you have more than one cat, they will need to each have their own scratch post plus one extra so there is always one free when they need it. Once you have a suitable scratch post, you need to put it somewhere where your cat will use it. Most cats like to scratch just after they’ve woken up, so next to their preferred snoozing spot is ideal. They also like to scratch near to their typical entrance or exit point to the house, eg the cat flap, so you could put it there instead. Even better, get several scratch posts and put them in different locations around your home so they always have one nearby. If your cat has already found a particular piece of furniture or carpet they like to scratch, the presence of a new scratch post, no matter how perfect it is, is unlikely to deter them on its own. To encourage them to use their new post, first cover the area they are currently scratching with a protective cover and put their new post next to it. You could also apply pheromone spray such as Feliway Classic to the scratched area to discourage them (just remember to check that the spray can be applied to the particular surface without damaging it further by carrying out a small test in a discreet area). Applying catnip or a pheromone product called FeliScratch by Feliway to the new scratch post is another way you can make it more appealing. Once your cat is comfortable using their new scratch post, you can then move it to one of the locations mentioned earlier so they are more likely to continue using it, and remove the protective cover from the original scratch spot.